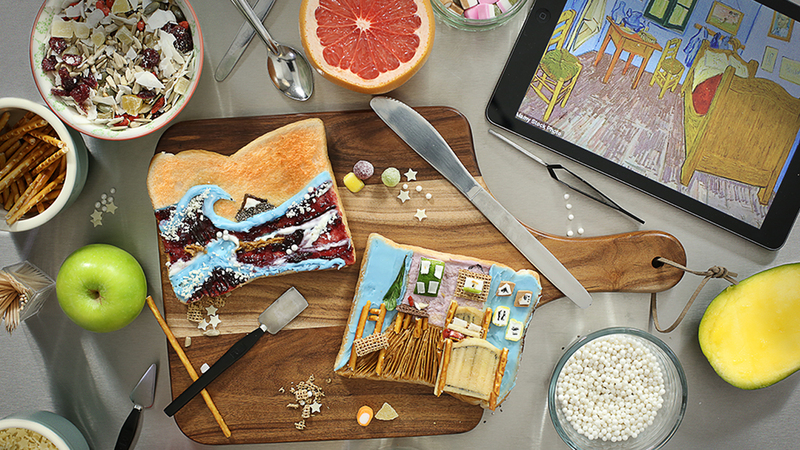 When it comes to breakfast, we all appreciate a bit of a masterpiece on our plate. 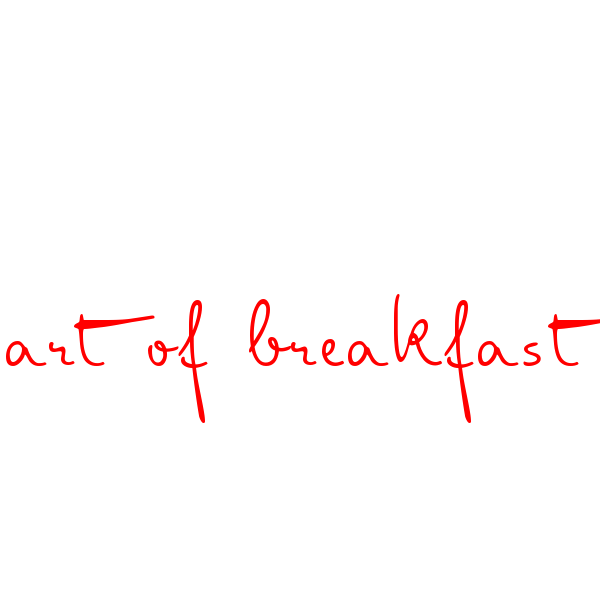 Whether you’re a fan of a fry up, like to keep it simple with some cereal or enjoy whipping up something more interesting, there’s no denying that breakfast is one of the tastiest meals of the day. But it can also be one of the most beautiful – and we don’t just mean creating Instagram-worthy portions. You can actually make art out of your brekkie, which is exactly what we challenged the food bloggers, Heather and Hannah, at Fresh Heather to turn breakfast into art in order to celebrate our new breakfast range, Maison. Arguably, this is one of van Gogh’s best known pieces. Painted in 1888 when he was in Arles, France, the piece shows where the artist slept when he was staying at the Yellow House. It shows his simple furniture and the slightly skewed wall of the room – it really was at an odd angle, although not quite as offset as the painting would have us believe. While the colours have faded over the years – the walls and the door were originally purple rather than blue – they are still lovely and bright, which was meant to express sleep. Vincent van Gogh originally painted his piece in oils on canvas, but the guys at Fresh Heather recreated it on toast using some popular breakfast foods. 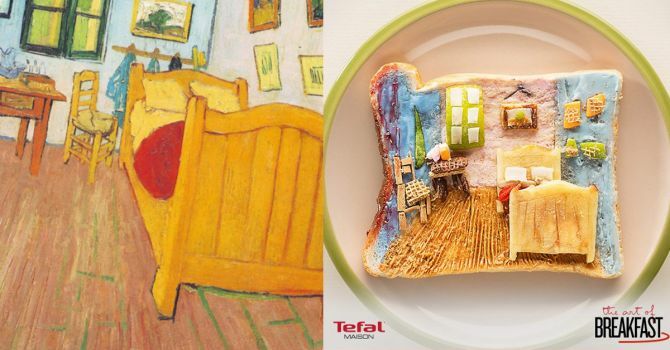 From the peanut butter floor to cereal chairs and apple bed, this piece of art really does look good enough to eat! Cezanne was arguably most famous for his still life paintings, even though at the time he created them, painting things like fruit was considered to be a low form of art. However, he didn’t paint his still lifes because he liked fruit a lot, instead, his images were created to show how light and space could be painted. He used techniques and added a lot of things to his still life paintings that others hadn’t before, making his bowls of apples – there are a fair few paintings of this kind – really stand out. Cezanne’s still life paintings are an imitation of what he saw, rather than an attempt to copy it completely. This means that some perspectives are a bit odd and the edges of things can appear to move. However, for Hannah and Heather, Cezanne’s ‘Still Life with Apples’ meant an opportunity to use chocolate spread and real apple to create the painting. What more could you want than a picture of fruit actually made out of fruit? You’ve probably seen posters of this iconic moggy at some point, but you probably didn’t know that the origins of the original poster are incredibly interesting. It goes back to 19th-century Paris – think Moulin Rouge – and Le Chat Noir cabaret, which was one of the most popular destinations for performers and artists to showcase their talent. The cabaret club was created by Rodolphe Salis, who ultimately started to produce a magazine that was filled with stories, cartoons and artwork done by the club’s patrons. It was Salis who commissioned Steinlen to design the poster, with a cat being chosen as the focus because he found a stray black cat during the renovation of the club. The poster advertises a tour of the Chat Noir’s Shadow Theatre and has become an important image from that time in France’s history. While the original poster is bright, colourful and memorable, we can’t help but think that a toast version featuring apple, grapefruit and icing is a lot more delicious and looks just as good! You certainly wouldn’t complain if you got it served up to you for breakfast. 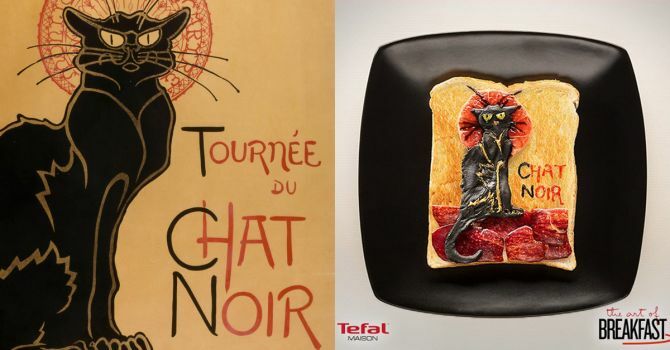 Discover more from the Art of Breakfast and the Tefal Maison range or watch the video below to see how the toast art was created. 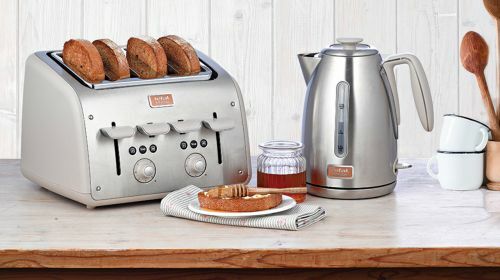 From taking centre stage in sage and onion stuffing to transforming a traditional carrot cake, who would have thought tea and toast could be such amazingly versatile cooking ingredients? Go Nuts For Our Squirrel Pancake Pan! You'll go nuts for our new squirrel pancake pan special edition pack, exclusive to Tesco. This year, get creative and take your pancakes to a whole new level! A top chef has banned diners from Instagramming their meals in his restaurant, but bloggers are arguing he could be missing out on marketing opportunities. So, who's right? Can Toast Reach New Heights? We've been celebrating the nation's love of toast during our Toast of Britain campaign, but it isn't just a breakfast food - you can have it for dinner and even dessert too.